KalaWebs Review 2019: Is KalaWebs a Good Hosting? 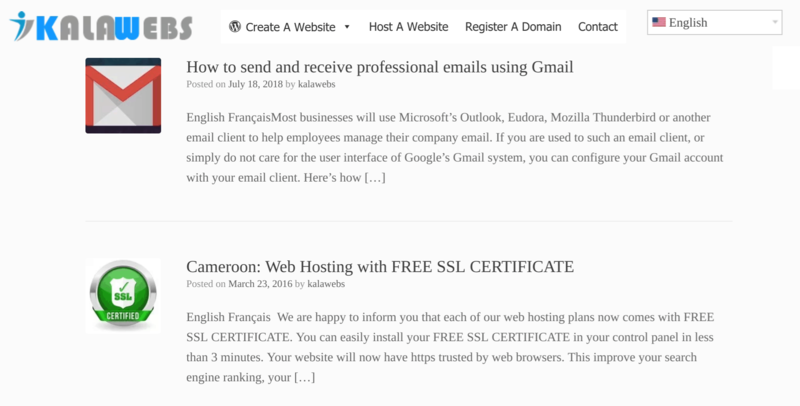 Web hosting company KalaWebs is based in Cameroon. As well as web hosting, it also provides domain registration and website development services. According to its Facebook page, Kala Website Services (or simply KalaWebs) started out in 2011. Today, this Cameroon company offers low-cost web hosting, domain name registration, and website design and development services without compromising on quality. The KalaWebs website supports English and French languages, but its cPanel supports 35 additional languages. If you need more bandwidth and storage, you should choose the higher plans. With no website design and development knowledge whatsoever, you can create your website using the RVsitebuilder user-friendly drag-and-drop website builder. Or you can use the Softaculous auto-installer to install WordPress, Drupal, Joomla, or Prestashop (plus many more applications). If you’re interested in WordPress specifically, you might instead choose one of the WordPress plans that provide a free domain and free hosting for a year. To keep your data safe at all times, KalaWebs provides 30-day R1Soft CDP backups, and to speed up the loading of your website it uses the CloudFlare CDN plugin. Other interesting features include SSH access, statistical tools (AWStats, Logaholic, Webalizer), and ImageMagick (to create, edit, and convert bitmap images). With KalaWebs, you also get a 99.9% uptime guarantee. KalaWebs’ hosting plans are affordably priced (in Central African CFA franc), but they don’t compromise on quality. You can pay through Express Union, Express Exchange, MTN Mobile Money, and Orange Money, but beware that the first year discounted price will go up in the second and subsequent years. If you’re not sure about signing up for a full year, you should note the 30-day money-back guarantee that gives you a potential “get out” if anything goes wrong. You can contact the 24/7 customer support team by telephone, email, WhatsApp, Skype, and an online form. My personal experience is that I couldn’t contact them through Skype, and my online form submission went unanswered, which could be because I’m not a current customer. KalaWebs offers affordably-priced feature-packed hosting plans plus web design and development services. Unfortunately, I found the support to be substandard. For low-cost web hosting that doesn’t compromise on quality, visit KalaWebs. Wondering how KalaWebs stacks up against other Web Hosting companies? Enter any other Web Hosting company and we will give you a side-by-side comparison.